New 11,530 square foot, 8-classroom, modular building. The new building features a double-loaded corridor, restrooms and associated sitework. Classroom types include: standard, special education, and computer labs. Each classroom is equipped with a Front Row system that is connected to an 80” LED TV. This system allows the teachers to mirror the images on their computers with the TV’s to enhance the learning experience. 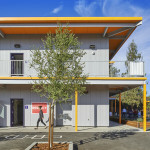 One and two-story modular classroom buildings for charter school campus in San Jose, CA. The two-story classroom building is a structural steel frame on a permanent foundation with 18 classrooms plus a learning lab, elevator and restrooms. The single-story modular building is a wood-frame shear-wall design which houses classrooms plus school administration offices and storage. Both buildings total 24,000 square feet. Project delivery is modular design-build. 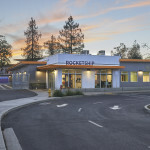 The new, 7,200 square foot, kindergarten classroom building replaces aging portables at the Richard Crane Elementary School, part of the Cotati-Rohnert Park Unified School District. 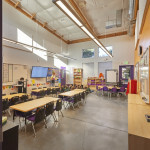 JL Modular worked closely with WLC Architects of Emeryville, CA, on the design which features partition walls, to give educators a 21st century collaborative learning environment. Green features include state -of-the-art lighting and electrical systems, extensive daylighting and recycled materials used throughout the building. Three building campus totaling 7,000 square feet. Features include a four-classroom building, admin building with teacher’s lounge, and multipurpose/gathering building with divider wall and warming kitchen. Buildings feature extensive green elements including clerestories and Solatubes for natural lighting. Design-build delivery of a new 11,000 square foot STEM building including, Science, Biology, Chemistry and Construction Technology Classrooms. Included restrooms, science prep rooms, chemical storage, double loaded corridor, large covered outdoor work area and covered entry. Plaster and Hardie exterior finish with storefront windows, sunshades and built up roof. 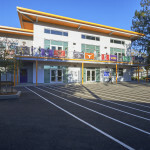 The new Vicente-Briones School is 13,000 square foot building, serving the Martinez Unified Adult and Continuation Schools. 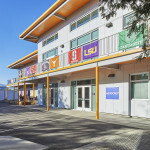 The building features six classrooms, cafeteria with warming kitchen, offices for administration and outdoor eating and gathering space. Two-classroom modular classroom building on an operating elementary school campus. 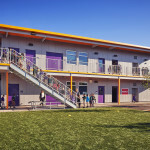 Scope included concrete slab and associated sitework and construction of two 30’x32 Classrooms. Design was JL Modular’s DSA Prechecked classroom.